Alex Cardoso is a third generation waste picker who lives and works in Porto Alegre, Brazil. His grandmother and mother both worked as waste pickers. He therefore likes to say he was born inside of a push-cart. He works at the waste pickers’ cooperative called, “Cooperativa dos Catadores de Materiais Reciclaveis do Loteamento Cavalhada” – also known as ASCAT4. He has worked there since 1997, two years after it was founded. 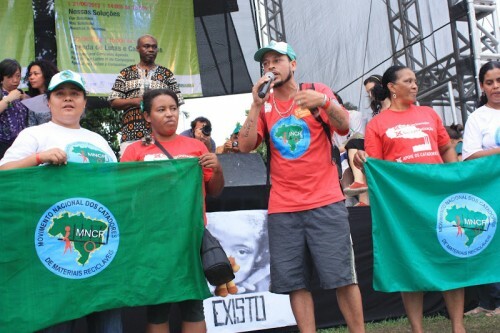 Alex is a representative of MNCR, Brazil’s national waste pickers’ movement. He serves on the national board, is part of the organizing team for southern Brazil, and is on the statewide coordination team. Alex is also part of the working group on climate change for the Latin American Network of Waste Pickers (Red Lacre). “Society needs to see the important role that we play for the environment and our cities,” he said. “With our profession, we create an economy out of virgin materials and create jobs for many people,” said Cardoso.